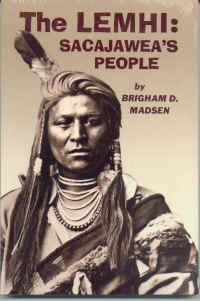 Description: Indian expert and historian, Brigham Madsen, records the story of the Lemhi from 1806 to about 1907. Exploitation of Sacajawea's people destroyed their centuries-old lifestyle. Conflicts arose and the tribe wandered throughout the northwest, trying to subsist in an unsettled nomadic life. This is the story, step by step, of how life changed for the Lemhi during a 100-year period. 9x6, paperback, 27 illustrations, 3 maps, 214 pages.